The Homalozoa, as that term is usually used, are plainly not a clade. Therefore, we will use the term simply to designate a grade of deuterostomes more derived than the Vetulocystidae, but outside the echinoderm crown group. In doing so, we will probably include groups which probably would not be called homalozoans in ordinary parlance -- assuming that one ordinarily cared to discuss homalozoans at all. A more conventional use of the word defines Homalozoa simply as a grade of physical organization, and composed for taxonomic purposes of the Stylophora, Soluta, Cincta and Ctenocystoidea. The four classes have little to unite them other than possession of a flattened theca and the absence of pentaradial symmetry. But, whatever, the definition, Homalozoait is not a terribly useful concept, since the arrangementof this area of phylospace is quite unstable at the moment, and it is impossible to say anything of interest about the difference between homalozoans and echinoderms. We simply have too little inforrmation about which is which. One historical point is worth making. Jefferies, e.g. Jefferies 1986), argued long and loudly that some Homaloza (the Mitrata, in particular) were ancestral to the Chordata. In fact, he continues to do so. See, e.g., Dominguez et al. (2003). The group putatively related to Chordata he called "Calcichordata," the thought being that the calcium carbonate plates which characterize the homalozoans had been exchanged for apatite in chordates. While Jefferies' phylogenetic hypothesis is no longer a serious contender, many of his anatomical observations are very much in play. In any case, it is common to see the term "Calcichordata" used as a synonym for Homalozoa. In 1941, Whitehouse introduced a new echinoderm subphylum Haplozoa for two genera of small fossils from the lowernmost Middle Cambrian of Queensland, Australia. 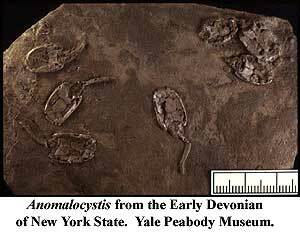 Each of these fossils was placed by Whitehouse in a new class, Cymbionites in the class Cycloidea and Peridionites in the class Cyamoidea. Ubaghs 1967b). Cymbionites is a generally hemisphaerical cup-shaped fossil with an average diameter of 12 mm. It is composed of five massive wedge-shaped plates tightly sutured together such that boundaries between the plates are often hard to distinguish. The median depression has fluted sides, and a tiny central plate is present at the bottom of the depression and surrounded by the others such that it is not visible from the exterior. Peridionites is even smaller, less than 10 mm in its maximum diameter. It is shaped like half a lens, semicircular in side view and elliptical in apical view. it is composed of five massive plates, two large terminal plates with two smaller mediolateral plates and a median apical plate. A deep, radially fluted central cavity divides the mediolateral plates. Whitehouse compared Peridionites to the dipleurula stage in echinoderm larval development, and Cymbionites to the pentactula stage of eleutherozoan development. He therefore suggested that "Cycloidea" was ancestral to the Eleutherozoa while "Cyamoidea" was ancestral to Echinodermata as a whole. While some workers have supported this idea, the majority have not. Others have suggested that these genera represent an eocrinoid both) or cystoid (Cymbionites only) in which the theca has been greatly reduced. They have also been regarded as non-echinoderms close to the origin of Bilateria, and Peridionites has been suggested to be a calcified benthic ctenophore. When he covered them in the Treatise on Invertebrate Paleontology, Ubaghs 1967b) placed both genera as Echinodermata incertae sedis. While echinoderm relationships were supported by the composition of the plates from a single calcite crystal with stereom microstructure and by pentaradial symmetry in Cymbionites, Ubaghs noted in regard to the various theories as to their relationships that "The temerity of some of these hypotheses contrasts with the weakness of evidence in support of them". Both Cymbionites and Peridionites simply don't preserve enough information to say much about them. The names "Cycloidea" and "Cyamoidea" are redundant with their constituent genera (and Cycloidea has been used for an order of fossil crustaceans besides) and in the absence of anything to support the two genera as closely related, the name "Haplozoa" is equally unnecessary.